Everybody's flirting with the Dark Side on television this week. Sam Winchester's discovering how bad he really went, Anakin Skywalker's getting a horrific vision, and Peter Griffin is hanging out with Death. Meanwhile, we're going back "Over There" on Fringe. John Laroquette is back on Chuck, and one member of the Luthor family is back on Smallville. And this week's TV movies include Ezri Dax fighting a garbage monster on Syfy — literally! — and the rise of Bikini Frankenstein. Television is your best friend. Allow us to demonstrate. Scooby Doo: Mystery Inc. has another new episode, at 7 PM on Cartoon Network. There's another new Chuck at 8 PM on NBC: "Chuck Versus the Seduction Impossible." Casey, Chuck and Sarah are sent to Morocco to rescue Roan Montgomery. Meanwhile Morgan plans to meet Alex's mother and Mary spends some time with her family. When Cuddy's mother is admitted to Princeton Plainsboro and wants House off the case, House must come up with non-conventional methods to treat her. In the process he uncovers secrets which Arlene has hidden from Cuddy and her sister Lucinda. Meanwhile, House's methods to treat Cuddy's mother leads Masters to question her "by the book" stance on medicine, and Taub gets a second job from his ex-wife's brother that takes a toll on him. Also at 8, there's a new Adventure Time with Finn and Jake on Cartoon Network. That's followed by the return of Mad at 8:15 with "Snot Pilgrim." (Really.) And then a new Regular Show at 8:30. Badly bruised and exhausted, The Cape (David Lyons) heeds advice from Max (Keith David) to take some time off to recover. Determined to finally kill The Cape, Peter Fleming (James Frain) hires a tech-savvy team, including Goggles (guest star Pruitt Taylor Vince) and Hicks (guest star Chad Lindberg), to track and destroy The Cape. Meanwhile, Orwell (Summer Glau) faces digital challenges against the teams' strong expertise and Dana (Jennifer Ferrin) becomes more involved in uncovering the truth about Vince's case. Also on at 9 PM: Syfy's remake of the British show Being Human, "Wouldn't It Be Nice (if We Were Human"). Here's a sneak peek. At 10 PM, National Geographic Explorer has the intriguing episode title, "How To Build a Beating Heart." Syfy has a Stargate Universe marathon all day long, to get you stoked for that show's return. At 7:30 PM, FX has the cable TV premiere of Death Race, the remake of Death Race 2000 starring Jason Statham. Prepare yourself for babes moving in slow-mo, Statham doing pull-ups shirtless, and the awesome warden played by Joan Allen. Jim refuses to let Stephanie help him stop a super-powered individual who is targeting her friend, she takes offenses and the two end up in a competition to take out the bad guy. Meanwhile, Daphne objects when Jim lets JJ date a senior, but won't let her do the same. And Katie learns something unexpected about her boyfriend. Anna's latest gift to Earth is "Concordia" but she's really hiding an invasion fleet of breeding vessels. Eli sees "Concordia" as the perfect time to assassinate Anna and sets about convincing the Fifth Column to carry it out. Syfy is having a Green Hornet marathon all day long. After Lance got bitten by a Mutraddi beast, he transforms into a monster at night. Nova ScienceNow is on most PBS stations at 8 PM, asking "How Smart are Animals? ", and at 9 PM, there's the regular Nova, about "Making Stuff Smarter." Which do you think will end up being smarter, animals or stuff? At 11 PM, SOAPNet has another episode of Being Erica, "Two Wrongs." At 10:45 AM, IFC is showing Kingdom of the Spiders, the awesome arachnophobic blowout starring William Shatner. Also, Oxygen is having a Buffy the Vampire Slayer marathon all day long, and Syfy is having a Doctor Who marathon until early afternoon. There's a new episode of The Vampire Diaries at 8 PM on The CW. Stefan (Paul Wesley) and Elena (Nina Dobrev) get away for what they hope will be a romantic weekend at the Gilbert family lake house, not realizing that they've been followed. Jenna (Sara Canning) starts to worry that Alaric (Matt Davis) isn't being honest with her. Jules (guest star Michaela McManus) explains the importance of the sun and moon curse to Tyler (Michael Trevino), but leaves out an important detail. Damon (Ian Somerhalder) attends a tea at the Historical Society in order to talk to Elijah (guest star Daniel Gillies), but Elijah isn't giving up any secrets. With help from Caroline (Candice Accola) and Jeremy (Steven R. McQueen), Bonnie (Katerina Graham) uses deceptive measures to get shocking new information out of Luka (guest star Bryton James). Finally, Tyler offers Matt (Zach Roerig) some relationship advice. Ooh, relationship advice from Tyler! This should be good. And there's a new Big Bang Theory, at 8 PM on CBS, "The Benefactor Factor." Ryan (guest star Noah Bean) intercepts a message about a dangerous cutting edge weapon coming into the U.S. so he asks Nikita (Maggie Q) to help him stop the delivery. Nikita discovers the man bringing the weapon into the country is Voss (guest star Matthew Marsden), a man she was forced to have a relationship with while undercover at Division. She reluctantly resumes her alter ego to retrieve the missile. Meanwhile, Michael (Shane West) interferes in Alex's (Lyndsy Fonseca) new life with Nathan (guest star Thad Luckinbill). Also at 9 PM: BBC America is having what's being called the cable TV premiere of the 1981 movie Excalibur. "Helen Mirren, Nigel Terry and Nicholas Clay take on leading roles in an imaginative retelling of the story of the legendary King Arthur." Archer is in for a huge (well, about ten pounds) surprise when his favorite call girl, Trinette, shows up at ISIS with a bouncing baby boy on her hip. And a subpoena for a paternity test in her purse. Is Archer the father of the wee baby Seamus? Well, that's what the paternity test is for. That's why they have those. There's a Primeval marathon all day long on Syfy. At 7 PM, Cartoon Network has a new Young Justice, "Infiltrator." That's followed at 7:30 by a new Ben 10: Ultimate Alien and a new Generator Rex. Clark (Tom Welling) is surprised to see Martha (Annette O'Toole) on the news speaking at a pro-vigilante rally. However, surprise quickly turns to horror when he and Lois (Erica Durance) watch as Martha gets shot on national television. Meanwhile, Lionel (John Glover) reveals himself to the world and reclaims LuthorCorp from Tess (Cassidy Freeman) and Oliver (Justin Hartley). Lois and Chloe (Allison Mack) decide to cheer Clark up by showing him videos from thousands of vigilante supporters professing their support for The Blur. Videos were created and submitted by actual "Smallville" fans. The Jedi remain stranded on Mortis, with Anakin Skywalker caught in an epic struggle between the light side and the dark side of the Force. 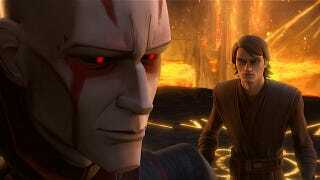 As the Jedi prepare for a decisive confrontation, Anakin must face some shocking visions of his own future. And here's a clip from the episode. Over There, a terrorist arms himself with a flesh eating insect, while alternate Olivia reunites with her boyfriend. Meanwhile, while determined to protect his universe, Walternate discovers there are some lines he won't cross. Sam (Jared Padalecki) starts to have flashbacks to a case he worked on with Samuel (guest star Mitch Pileggi) before he reconnected with Dean (Jensen Ackles). Sam receives a mysterious text with coordinates to a small town, so the brothers decide to investigate. Dean is surprised when the townspeople start telling him some of the things Sam did while he lived there. Also at 9 PM: Hallmark has a new TV movie, Smooch, in which a little girl (Mad Men's Kiernan Shipka) kisses a frog and it apparently turns into a prince — a handsome young man who can't remember how he wound up dissheveled in a park. She takes him home, and he randomly gets hired as her nanny. At 10 PM, there's a new (to Americans) episode of Merlin on Syfy. There's also a new Onion News Network on IFC at 10 PM. Also at 10 PM: a new Spartacus: Gods of the Arena on Starz. In Iron Invader, premiering Saturday, February 12, at 9PM (ET/PT), a meteorite crawling with space bacteria crash lands in a junkyard. The unusual combination of alien bugs and Earth garbage brings a huge metalwork to life. The ungrateful Iron Invader then goes on a killing spree. The movie stars Kavan Smith (Eureka, Red: Werewolf Hunter). Nicole de Boer (Dead Zone, Stargate: Atlantis) and Donnelly Rhodes (Battlestar Galactica, Tron: Legacy). Iron Invader is a production of Cinetel. Yes, that's a giant garbage monster from space. Why do you ask? And science fiction legend John Cleese (well, he helped give us the blancmange monster, anyway) appears on The Graham Norton Show at 10 PM on BBC America. Or you could stay up until 12:35 AM and watch the awesomely titled Bikini Frankenstein, starring Brandin Rackley, on Cinemax. Does Bikini Frankenstein bring bikinis back to life? Or what? Now that all that sporting business is over with, Fox's animation bloc is back, with American Dad at 7:30 PM, The Simpsons at 8 PM, Bob's Burgers at 8:30, Family Guy at 9 and Cleveland Show at 9:30. In the Family Guy episode, Death shows Peter two different lives: one where he drinks alcohol, one where he doesn't. Adult Swim is showing a new Robot Chicken at 11:45 PM. That's followed by a new Mongo Wrestling Alliance at midnight.